1. Preheat oven to 350. Line bottoms of two round baking pans with parchment paper rounds and coat sides with cooking spray. Batter fits in two 6” by 3” pans or two 8” by 2” pans. 2. Combine wet ingredients in a mixing bowl and whisk to combine. Add dry ingredients and whisk until flour is incorporated. Pour half the batter in each pan and bake at 350 for 30 minutes, or until toothpick inserted in center comes out clean. Let cakes cool fully before frosting. Beat cream cheese and butter until smooth. Add powdered sugar and vanilla and continue to mix until smooth and slightly fluffy. Melt the white chips with the cream in the microwave and mix until smooth. Add the color powder straight to the ganache and stir with a whisk until evenly blended, then pour mixture into a piping bag or plastic baggie. 1. Before assembling the cake, level each layer by slicing off the rounded top. 2. Once cakes are level they can be stacked and frosted. To achieve the semi-naked look, use a bench scraper or flat spatula to scrape the exterior frosting to the desired thickness. 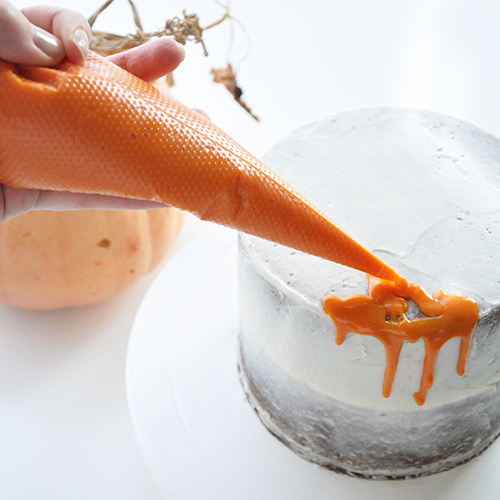 A turntable is helpful to turn the cake as you scrape. 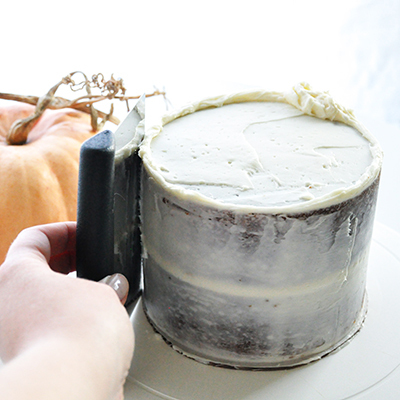 When the sides are smooth, use a clean bench scraper or spatula to drag the messy edges into the center of the cake and achieve a sharper edge. 3. Pipe the warm ganache around the top rim of the cake and let it drip down the sides, then fill in the top. 4. Finally, use a large star tip and leftover cream cheese frosting to pipe rosettes around the top edge. A delicious no-churn ice cream recipe anyone can make, embellished with dark chocolate and fall pumpkin seeds. Makes a half gallon of ice cream. Enjoy a holiday dessert in the beloved mason jar, or these colorful cakes can make wonderful gifts too! Follow recipe on back of box. Bake and cool cake. 2. Blend dry ingredients: powdered sugar and ColorKitchen color packet (optional). 3. Add heavy cream, peppermint oil and vanilla extract. Cut cake into circle pieces with a cookie cutter, or crumble cake and layer with whipped cream. Top with peppermint candy pieces. A better-for-you alternative to the classic birthday cake with confetti sprinkles! Go ahead and throw confetti on your cake with all-natural ingredients! Our colorful confetti is free from artificial dyes, and the gluten-free vanilla cake mix is made with over 90% organic ingredients, so you can have your cake and eat it too! 1. Follow instructions for making ColorKitchen Gluten-free Confetti Cake Mix, but save ½ of the confetti sprinkles and set aside. 2. Bake cake in tray and cool. 3. Cut out round shapes with circle cookie cutter. 4. Layer cake circles with frosting. 5. Sprinkle top of cake and sides with confetti. Depending on size of circles, one box of cake mix will make a couple 6 inch mini cakes. You can also color frosting with your favorite ColorKitchen plant-based food colors. Here is a fun and festive recipe for you and your loved ones. Make as a Holiday treat or give as special homemade gift. 1. Preheat oven to 200 degrees F. Line sheet pan with parchment paper. 2. Mix ColorKitchen color packets with a couple drops of water and set aside to fully dissolve. 3. Beat egg whites, salt and sugar together in an electric mixer for 10-12 minutes until the mixture is smooth and firm. 4. Fill a piping bag with meringue mixture. 5. Applying gentle pressure, making same size kisses when piping. 6. Bake for 1+ hours. 7. Let meringue kisses cool. 8. Mix icing ingredients with dissolved color until thoroughly blended. Dip cooled kisses in icing and let dry overnight. This delicious pie is rich and chocolaty, made from healthy raw and refined sugar-free ingredients. Enjoy with orange icing (mix of yellow and beet red ColorKitchen color packets) on top for a fall dessert this Halloween or Thanksgiving. Place all the ingredients in a food processor and blend until combined and sticky. Transfer into pie dish. Form into a pie crust by pressing it down with your hands and smoothing until it's even around the edges and flat on the bottom. Place the pan into the refrigerator to firm up while making filling. Place all chocolate ingredients into food processor and blend well. Pour chocolate mixture into pie crust and chill until firm. 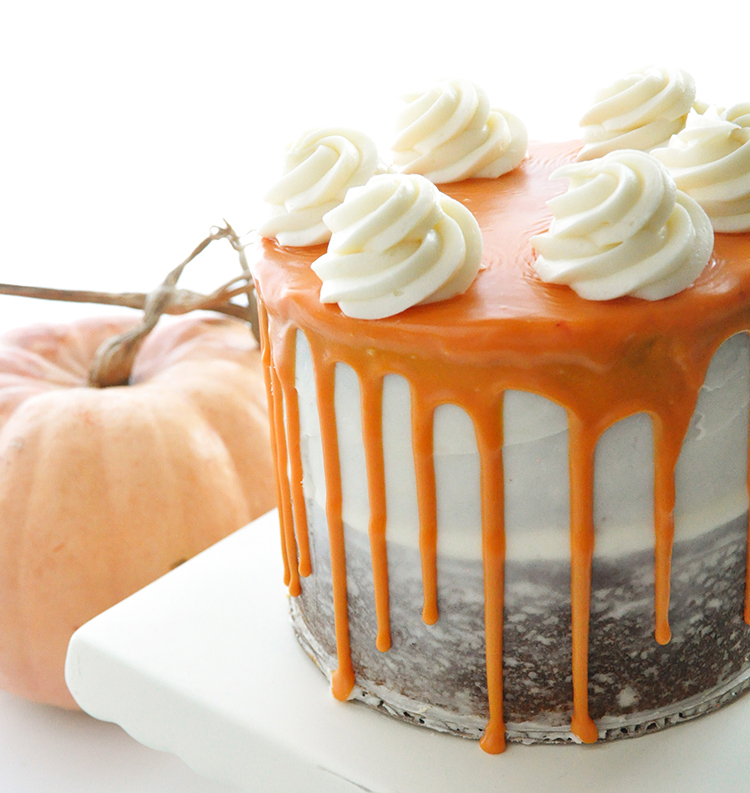 Once firm, drizzle colored icing on top and leave out until room temperature before serving. It's almost time for me to wrap up my visit with my mom in foodie paradise Leelanau, Michigan. Driving through the country, you just have to love the small town farm stands, with self-serve produce and an honor system payment jar. It wouldn't work for the urban farmer, but it's nice to see a way for small, rural farmers like these to sell their local organic crops. One of the many things I love about visiting my mom in Michigan (where I was born), is day-tripping around to the local food makers. As a handcrafted chocolate lover, Grocer’s Daughter Chocolate is one of favorites with local, organic, and natural ingredients. This trip I discovered their cardamom chocolate truffle and was in heaven! The fall season is synonymous with baking; as temperatures cool down, we seek and find comfort in foods that warm the soul and nourish the spirit. Memories of days from childhood spent sipping hot apple cider, coming home from school to the smell of freshly baked gingerbread, indulging with pumpkin spice and apple cider doughnuts, all contrive to make us long for those crisp, cool autumn days to deliver us from the stifling heat of summer. After those long, hot summer days where we do very little cooking and baking and instead fill up with salads, fruit, and sandwiches, autumn comes and rescues us, reawakening our energies as it infuses everything around us with life, from the trees ablaze with color to the produce we eat. The bounty of food in the fall means there are so many wonderful options for baking, but you may not know where to start. We will highlight some of the best fall produce to use in your baking endeavors this fall. The sheer varieties of apples to choose from may overwhelm you, but they all serve different purposes, ranging in taste from a softer to a crisper bite, and from tart to sweet. If there are varieties you would like to try but aren’t sure if they would be best for baking, grab a few different kinds at the market and see what you think of the flavor. While you can usually buy apples year-round, they are at their best from September to November, perfect for the fall season. When selecting organic apples at the market, look for ones that are firm with no bruising and are vibrant in color. The skin should be tight and smooth and they should smell fresh. There are so many options for using apples in your baking: baked apple and cinnamon oatmeal, apple tarts, apple pie, fresh apple cider, apple cider doughnuts, and much more! The sweet potato is incredibly versatile as it can be used in both sweet and savory dishes and is an invaluable ingredient when it comes to fall baking. To ensure you buy sweet potatoes that are actually sweet (those with pale yellow flesh are not sweet), look for the organic, darker variety with thick, smooth skin and bright orange flesh, making sure there are few bruises when you pick them out. For sweet treats made with sweet potatoes, try roasting them with some cinnamon and honey, bake a sweet potato pie, whip up some sweet potato chocolate pudding (yes, you heard right, a healthy pudding! ), or bake a sweet potato and apple casserole. Oh, the glorious pear - nearly as versatile as the apple, but with a uniquely sweet and subtle spicy flavor that pairs so well with cinnamon and vanilla in a variety of desserts. When selecting at the market, test for ripeness by applying light thumb pressure near the pear's stem. If it is ripe, there will be a slight give. Pears are delicious on their own (again, much like apples), but truly come alive when combined with other ingredients or baked in sweet desserts. Try drizzling some with honey or maple syrup and seasoning with cinnamon to bake for about 20 minutes - then add to oatmeal for a perfect homemade batch. But don’t stop there! Why not try pear pie, pear strudel, and pear cobbler? Make the most of this delectable harvest. No list of fall produce would be complete without the glorious pumpkin. This squash makes its way into many desserts (although it can also be enjoyed in savory dishes, such as pumpkin soup), and while canned pumpkin will certainly serve its purpose, it’s so much better to enjoy this beauty fresh while it’s in season. If you have a food processor, making your own pumpkin puree to use in many meals is so simple. To select at the market, look for organic pumpkins that are small, about 5 to 8 pounds, with tough skin. They are lauded for their concentrated flavor and sweetness. Then have fun baking! Use fresh pumpkin puree to make pumpkin spice pancakes or if you live in a slightly warmer climate but still want a taste of fall, try out pumpkin spice smoothies. You are only limited by your imagination, as the possibilities are nearly endless: pumpkin spice doughnuts, pumpkin pie, baked pumpkin spice oatmeal, pumpkin dip for gingerbread cookies, pumpkin biscuits, pumpkin scones, pumpkin bread, chocolate chip pumpkin muffins, pumpkin pound cake, and much, much more! To round out our list, we’d like to mention that whatever you might be baking, it can be fun to add festive colors to your desserts with natural food dyes (much healthier than anything with artificial ingredients). Traditional fall colors are often orange, brown, red and yellow. And of course, red and green are perfect as the Christmas season approaches. We have a wonderful selection of natural food coloring, with holiday packets as well as individual red and yellow packets (and more!). You can make orange coloring by simply combining red and yellow, or make some green coloring by combining our blue and yellow packets. We hope you have fun coloring your favorite fall desserts and baking up a storm with the wonderful harvest of fall produce available! When you have good ingredients, cooking doesn't require a lot of instruction because you can never go very wrong. If you ever need an activity to do with your kids, or if you're camping and you want to add a little pizzazz to your campfire time, try this fun activity! Bring a couple paint brushes and some ColorKitchen powder along with you. Scoop a teaspoon of ColorKitchen food coloring into a small bowl and add a couple drops of water. Use your paintbrush to mix the coloring and the water together. Then, let the kids have a go at painting faces and other designs on the marshmallows. Artistic skill is not necessary to have fun with this activity! When they're finished, toast the marshmallows over the open fire to a golden brown for a yummy treat. Toasted marshmallows and s'mores are a staple for camping, and even if the kiddos consume more sugar in one night than they would in a normal week, you can feel good about the source of ColorKitchen's dyes--foods from nature. If you don't have access to a campfire, this could be a fun everyday activity. With enough marshmallows and creativity, your kids could even create a marshmallow army!